PHOENIX -- The spread out, wide open southwestern part of the United States has suddenly become full of professional football teams. The latest joined the mix Monday, when the Oakland Raiders were approved by a 31-1 vote at the NFL annual meetings to relocate to Las Vegas, a move that's expected to take place by 2020. In a matter of 10 months, the bottom left of the country went from two NFL teams -- the Arizona Cardinals and San Diego Chargers -- to four, when the Rams moved to Los Angeles for organized team activities last May and then the Raiders' decision here in Phoenix on Monday. So, how will having two new regional neighbors affect the Cardinals? It all depends on who you ask. But sports economic and marketing experts agree there will be very little, if any, harm done to Arizona's brand or its regional market share. Andrew Zimbalist, a professor of economics at Smith College in Massachusetts, who's considered one of the leading sports economists in the country, believes having more teams in a region can actually benefit the area. "It intensifies football culture in the southwest more generally and it creates natural rivalries that didn't exist before," Zimbalist said. In general, experts don't think the Raiders will steal any of the Cardinals' fan base. Marc Ganis, president of Chicago-based firm Sports Corp, said Arizona's fandom has been solely focused on the Cardinals ever since they moved to the desert in 1988. He feels Arizona is insulated from the Los Angeles and Las Vegas effect, where there are other established teams and colleges who can draw attention away from the cities' newest occupants. However, Zimbalist feels if the Raiders can poach any Cardinals' fans, it'll only be from the northwestern edge of Arizona. John Vrooman, a Vanderbilt University sports economist, doesn't think the Raiders fit in what's now a crowded southwestern football market. 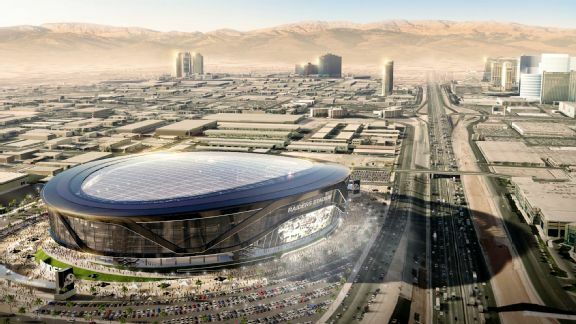 "The Raiders would be desert-locked in a small economically isolated and lopsided Las Vegas," Vrooman wrote in an email to ESPN. "The Broncos rule the Mountain West and the Cards now own the Southwest desert. When the Raiders leave the Bay Area, the 49ers will have NorCal locked down and that leaves the Rams and Bolts to split SoCal. There just would be no economic room for the Raiders in the Southwest desert and the Vegas market doesn't have the size or depth to carry the club alone." One benefit for the Cardinals in the last year of relocation is that the Phoenix market won't have to adjust to having new pro teams in a predominantly college market, Ganis said. The Rams and Chargers will now contend against USC and UCLA. The Raiders will have to play in a city where UNLV has been long established as the only show in town. However, Ganis said the Cardinals' TV exposure will be limited because stations in Los Angeles and Las Vegas will be showing their home teams rather than the Cardinals, if they're broadcast regionally. Another area that the Raiders' move to Las Vegas will impact Arizona, Ganis said, will be the state's quest to attract major sporting events such Super Bowls and Final Fours. For years, Ganis said, University of Phoenix Stadium was the only retractable roof stadium in the Pacific time zone. After the Raiders' and Rams' stadiums are built, there will be three covered stadiums. That will force Arizona to step up its game when it wants to recruit and attract major events, whereas in the past, it may have been a slam dunk for major games to land in Glendale. Ganis feels Arizona will have to be more aggressive in their sales pitch and work even harder to get the municipalities around Phoenix involved and on the same page to win events, in part because a multi-city pitch is difficult and in part because going to Las Vegas or Los Angeles will be more attractive to major events. "It's doable," Ganis said, "but it's harder."